Until recently, if you were "hearing voices" that people near you couldn't, it was almost a certain symptom of some type of insanity. Not anymore. Now, while walking in the streets you may hear voices talking to you... and just to you, with no one else hearing them except you. But they are not really voices in your head, they are the latest use of "audio spotlight", a technology that allows to direct sound to a very focus point, something you could call "a sound beam". So far this technology has been used in Epcott Center and the Smithsonian Institute in Washington DC as well as in a couple of Museums but the technology also known as "Holosonics" (that is the name of the company providing the service), has made its way into advertising. Considering how these hypersonic sound beams work, you can say that your skull becomes the speaker because the sound only becomes noticeable to the listener when the traveling sound waves impact a surface organic or human. The sound resonates against whatever surface they hit... what means that if you are not aware, they may sound like "voices in your head". "New Yorker Alison Wilson was walking down Prince Street in SoHo last week when she heard a woman’s voice right in her ear asking, “Who’s there? Who’s there?” She looked around to find no one in her immediate surroundings. Then the voice said, 'It’s not your imagination.' Indeed it wasn't. 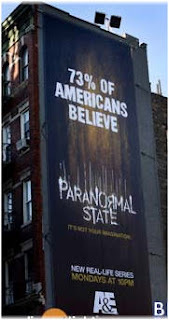 It was an ad for “Paranormal State,” a ghost-themed series premiering on A&E..."
1. What would walking in the city may be if every billboard has something to tell us, and they "resonate" like if those were voices in your head? Wouldn't that make crazy ones even crazier? In fact, wouldn't that drive perfectly sane people insane? 2. While the technology itself has some very interesting and good applications is also being considered to aim targeted advertising directly at the point of purchase, for example the supermarket. How much we can take on that? What would happen if every shelf talks to us? I know that our mind evolves and we can take information in ways that we couldn't before. I can watch two TV series at the same time, going back and forward with the remote control, something my grandma's couldn't take. So I have no doubt that we can get used to these targeted messages if they becomes popular, but as with many other things we can't be sure how it may affect us...some of us or all of us. What do you think? Could you take it? Should we? Ok, I don't even want to think this....as I bury my head in the sand!